Home » Advocacy & Action » Celebrate Freedom Week Day 1! Due Process Bill Moves! Celebrate freedom week was instituted by the Kansas Legislature in 2013. The purpose was to mandate that students be taught specific aspects of Kansas and United States history. Setting aside the fact that some in the Kansas Legislature seem to have lost sight of the participatory democracy at the heart of free society, we encourage you to come and remind them that celebrating freedom means EXERCISING YOUR RIGHTS. Many school districts are currently on spring break offering an excellent opportunity for teachers, parents, and families to come to the statehouse and engage their representatives. 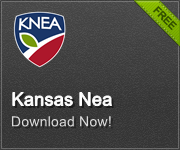 Each morning this week, a KNEA staffer will be available at about 9:30 a.m. in the statehouse to help you connect with your representatives. Take advantage of the time and plug-in. Today marked the final leg of Game On for Public Schools’ walk to Topeka. Started by a parent, Heather Ousley, from Merriam, Kansas four years ago, this advocacy event has grown massively. 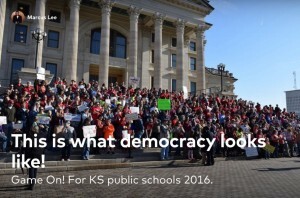 This year, three groups of walkers from Kansas City, Manhattan, and Emporia spent the weekend walking to Topeka to highlight the plight of public schools in Kansas. Walking the final mile to the statehouse were a group of public education advocates approaching and perhaps exceeding 1,000 parents, teachers, school administrators, board members, and most importantly kids. This group seized an opportunity to stand up strong for public education. Now is the time to follow-up their efforts and keep a visible and vocal presence in the statehouse this week. Click Here to view a photo essay from today’s public education rally at the statehouse. The House Appropriations Committee this morning heard reports from Rep. Amanda Grosserode (R-Lenexa), chair of the Education Budget Committee and Rep. Ron Highland (R-Wamego), chair of the House Education Committee on the discussions held in their committees on the Alvarez and Marsal Efficiency Study. There were three recommendations that were particularly controversial; two were in the Education Budget Committee. The first proposal would have the state sweep unencumbered cash balances from school districts. A&M suggested that fund balances could be capped at 15% and have a minimum of 10%. The sweep in the recommendation would provide a one-time influx of cash. A&M also said that such an action should not be taken until the legislature introduced year-to-year stability in school funding. Grosserode reported that the committee should not proceed with this recommendation without first gathering a lot more information and balances that were more up to date. The other proposal deals with requiring school districts to make purchases via the Department of Administration’s procurement list. Grosserode reported that the committee has proposed legislation to require districts to use the procurement list unless there is an existing contract or the district is making the purchase via a service center or the district can source the item within 1% of the price on the procurement list. Highland reported on the proposal to create a state-wide health insurance plan for school employees. Highland said the state should proceed very cautiously as there were so many complications to consider. As with the cash balance proposal, the committee suggested a lot more data was needed including how benefit plans interacted with salaries in teaching. The expected a lot of push-back from teachers and school districts should they move forward with this proposal at this time. Chairman Highland also reported that they were recommending that the state go ahead with recommendation to establish a centralized grand writing function to capture more grant money for schools. The House Education Committee went ahead with plans to gut a Senate Bill (SB 136) and fill it with the contents of House Bill 2531, stripping community and technical college instructors of due process protections. Rep. Ed Trimmer (D-Winfield) successfully amended the bill by adding in a requirement that those colleges utilize the e-verify system to ensure that they were hiring only legal workers. After the amendment passed, a motion to reconsider was offered by Rep. Kevin Jones (R-Wellsville). The amendment was reconsidered and passed yet again. Rep. Valdenia Winn (D-Kansas City) offered an amendment to move the effective date to July 1, 2018, two years from now. Winn argued that this would give the colleges and their employees time to negotiate their own due process provisions. Many of the opponents said they would never deny due process protections so the Winn amendment would let them demonstrate such a commitment. The Winn amendment failed. The bill, as amended, was then passed out of committee and will go to the full House for consideration.